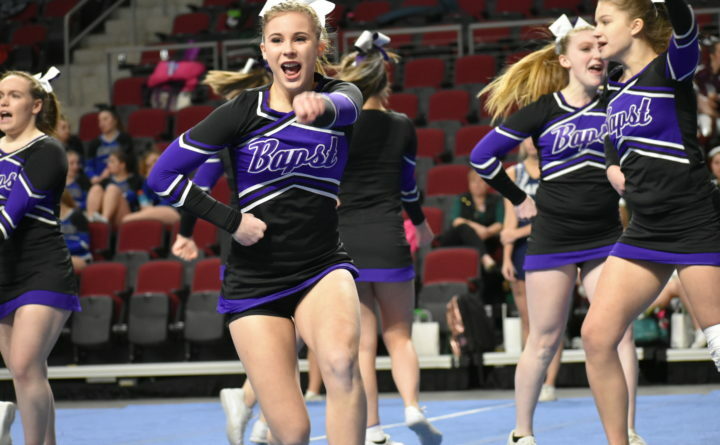 The Ellsworth High School cheering team performs its routine on Saturday at the Class B North championships at the Cross Insurance Center in Bangor. The Eagles were the runners-up. 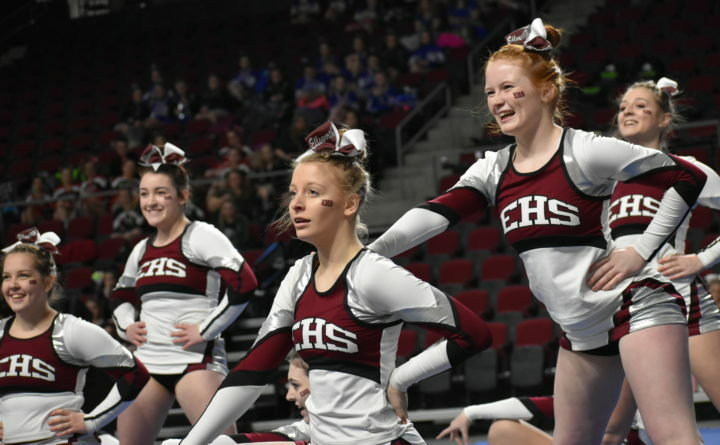 Old Town High School competes during Saturday's Class B North Regional Cheering Championship at the Cross Insurance Center in Bangor. The Coyotes took third place. 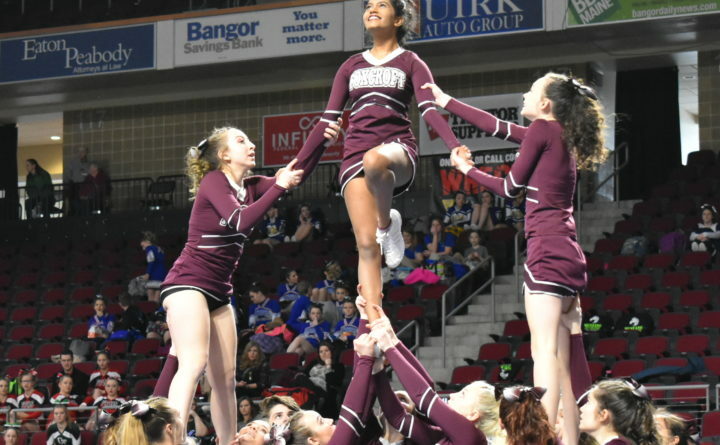 Washington Academy of East Machias performs during the Class B North cheering championships on Saturday at the Cross Insurance Center in Bangor. 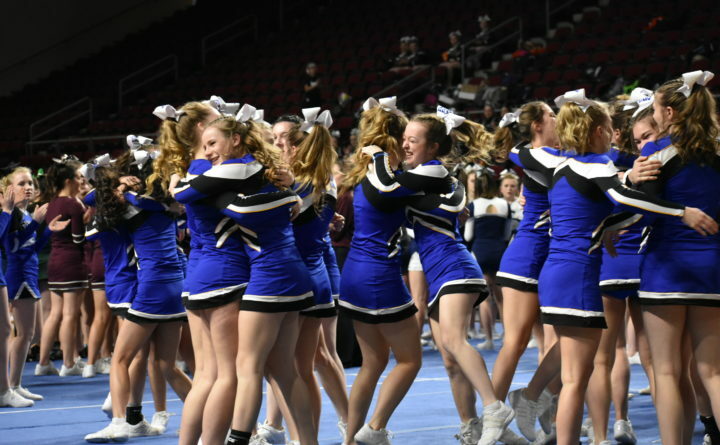 BANGOR, Maine — The Hermon High School cheering squad has had relatively few disappointments during a recent run of success highlighted by six Class B state championships in the last seven years. But the Hawks are not infallible, as a botched pyramid during the recent Big East Conference championship meet proved. That mishap may turn out to be bad news for Hermon’s competition during the remainder of the season. 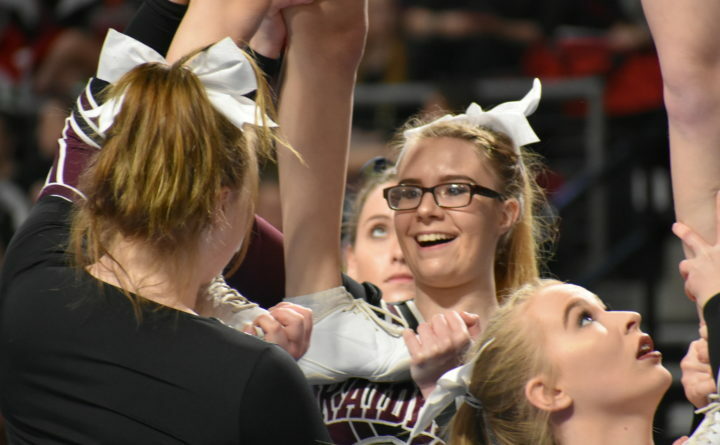 Coach Kristie Reed’s club first rebounded to capture the Penobscot Valley Conference Class B title, then showed more championship form Saturday by winning the 15-school Class B North competition at the Cross Insurance Center. 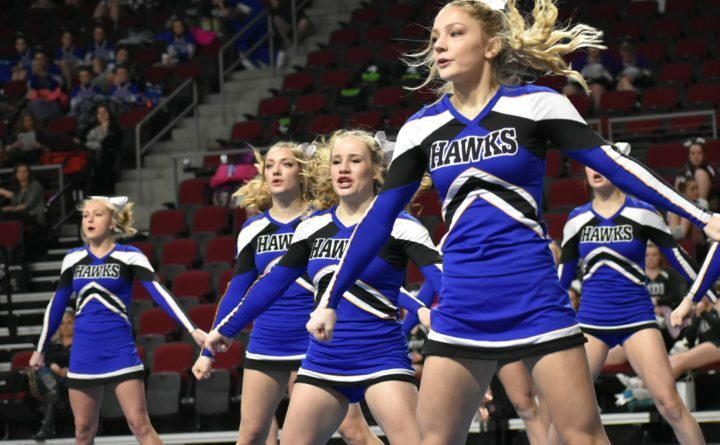 The Hawks shook off a slight hiccup on the first stunt of their three-minute routine to score a season-high 85.5 points and defeat second-place Ellsworth (81.4). 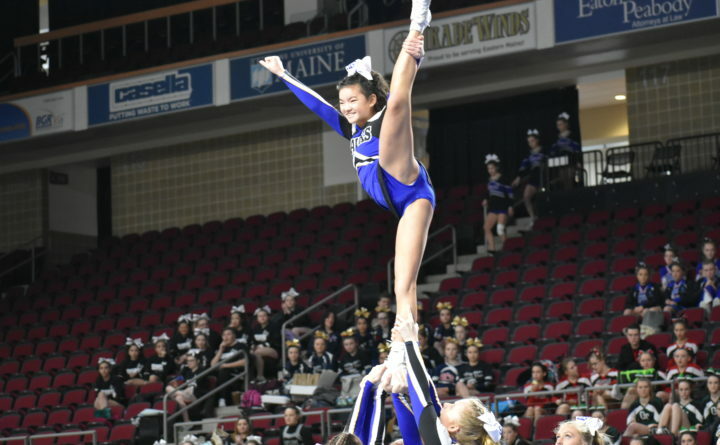 Hermon and Ellsworth earned berths in the Class B state championship meet to be held Feb. 10 at the Cross Insurance Center along with Old Town (75.9), Mount Desert Island of Bar Harbor (65.9), Gardiner (62.9) and Erskine Academy of South China (57.5). Other teams in the regional field were Presque Isle (55.4), John Bapst of Bangor (54.8), Foxcroft Academy (54.3), Mount View of Thorndike (51.1), Caribou (50), Nokomis of Newport (49.4), Washington Academy of East Machias (48.6), Winslow (47.2) and Waterville (47.1). Hermon’s roster features 14 freshmen and sophomores, and the missed pyramid at the Big East competition — where Ellsworth won with 73.7 points compared to the runner-up Hawks’ 60.7 — provided the younger performers an early season dose of competitive reality. “Every team has their weekends,” said Hermon senior Laura Zenk. “Everyone comes out and does their best but some weekends things just happen. We were super excited, but it was definitely a rough weekend. The Hawks believe that early setback already has provided a valuable lesson learned as the team pursues another state championship. Team members for the Hawks are Peirce, Zenk, Jasmine Boulier, Brooklyn Brown, Jenika Buck, Triunity Butler, Kalley Curry, Cali Cyr, Mercedes Davis, Ashley Dunphy, Kate Fergola, Mia Foley, Jazmin Landry, Kristen Lusignan, Hannah Morin, Olivia Nash, Krista Newcomb, Jillian Shorey, Leah Thibault Myatt, Emily Wiley and Torria Wittmer. Coaches are Reed and Christina Paradis.